Interview examines how scientific assumptions about materialism and consciousness have constrained us. Alex Tsakiris: I think that’s part of the problem. I think all these questions of the spiritual are not buried deep in these scientific questions you pose — they’re right there under the paper-thin surface of them. Take survival of consciousness, if we just look at the data and we say, “That seems to suggest that consciousness survives death,” well, for any man on the street, as well as any scientist, that proposition immediately launches us into deep questions of the spiritual. I don’t know how you can get around that. Dr. Rupert Sheldrake: I think it’s quite important to decouple these. Although the science is very relevant to these issues it doesn’t map in such a way that to be an Atheist you’ve got to be a Dawkins-style materialist or to be a religious person you’ve got to be a dualist. I think what we’re heading for is a post-materialist worldview which is what my book is trying to point the way towards. We could have a holistic way of looking at things, a scientific investigation into things, which leaves these bigger questions open. For example, in one chapter of the book where I’m dealing with the dogma that memories are stored as material traces inside the brain that becomes the question, are memories stored as material traces in the brain? I’m not confident memories are stored in brains. I think that brains are more like tuning devices, more like TV receivers than like video recorders. Now that’s really a scientific question, how is memory stored? We can do experiments to try and find out how memory works. So for materialists it’s a simple two-step argument. Memories are stored in brains; the brain decays at death, therefore, memories are wiped out at death. Whereas, if memories are not stored in brains then the memories themselves are not wiped out at death. They’re potentially accessible. That doesn’t prove they are accessed, that there is personal survival. It just means that’s a possibility whereas with materialism it’s an impossibility. So one position leaves the question closed and the other leaves it open. 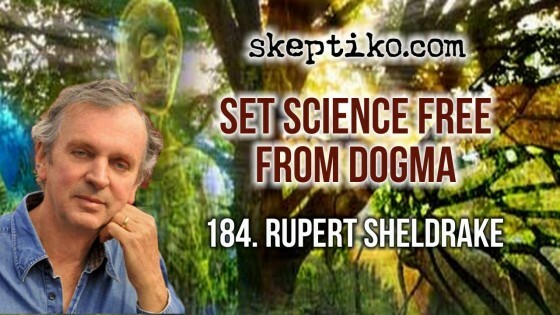 Alex Tsakiris: Today we welcome back to Skeptiko biologist and author, Dr. Rupert Sheldrake. He’s here to talk about his latest book, The Science Delusion. If you’re here in the U.S. you’ll find it at Amazon under the title, Science Set Free. Rupert, welcome back and thanks for joining me. Dr. Rupert Sheldrake: It’s very good to be with you again. Alex Tsakiris: Well, as folks who are long-time listeners of this show probably know, you are not only the first guest on Skeptiko but your work was certainly a source of inspiration for the show. Now all these millions of page views and downloads later, I want to again thank you for helping to send me on this journey. It’s been wonderful and I certainly appreciate the guidance that you’ve given along the way. Dr. Rupert Sheldrake: Well, I’m really impressed with what you’ve done, Alex. I think that you’ve moved this whole debate to a new level because you’ve been able to bring in people from both sides and open up these questions. Before that there were people in warring camps who didn’t talk to each other. I think yours is probably the only platform which gives free, fair hearing to all points of view in this controversial area. Alex Tsakiris: Speaking of warring sides, that’s probably a great segueway into your latest book. I wanted to, in the introduction there, highlight this title change because I’m quite curious. I understand that as an author you can’t always control the whims of a publisher who looks to sell more books, but wow, what a change from The Science Delusion and everything that conjures up to a big old smiley-faced Science Set Free. Any thoughts on that? Dr. Rupert Sheldrake: Well, in Britain my original title was to do with the dogmas of science and liberating science from dogmas. But my British publishers were very keen to call it The Science Delusion because, of course, that plays off the title of Richard Dawkins’ book, The God Delusion. The book is not an answer to Dawkins. He’s mentioned a few times in the book but it’s certainly not a kind of critical response. The sales and marketing team in Britain and my publishers said my book would sell twice as many if it was called The Science Delusion compared with my original title. So they twisted my arm and I agreed to it. I mean, I’m okay with that title. But in the U.S. the publishers didn’t want to call it The Science Delusion. First of all, Richard Dawkins and this book, The God Delusion, are much less well-known in the U.S. than they are in Britain. Everybody’s heard of it in Britain. In the U.S. quite a lot have heard of it but even when I’m talking to friends of mine in the U.S. and in Canada, sometimes I say, “The God Delusion by Richard Dawkins,” and they say, “Richard who?” He’s simply not as well-known except in the kind of Atheist reaction list crowd. He’s fairly well-known there. The other thing is that the people who haven’t heard of him or his book and who wouldn’t get the allusion to The God Delusion, they were afraid that many people in the U.S. would react to this as a kind of right-wing tract, pro-Creationism, anti-Climate Change because there’s a kind of anti-science movement in the U.S. which doesn’t really exist in Europe. They thought people would misidentify this book as a political attack on science. In fact, it’s pro-science. It’s trying to advance science and the scientific agenda by helping to free it up from the dogmas that are holding it back. It’s not anti-science, it’s pro-science. Science Set Free captures the meaning, the intention of the book better, actually. Alex Tsakiris: Great. I’m glad you think so and I think the book is pro-science. I definitely want to talk about that and I guess the way into that is to pull apart this word “science.” You spend a good deal of time talking about it and the history of science and the philosophy of science. But of course, as soon as we get in there we’re kind of burdened with this science as a position versus science as a method. Inasmuch as we’d like to look at it in purist terms and say it’s a methodology and it’s really just a toolkit, it also does represent something in the public discourse. We have science as a position. How did you handle that in your book? What did you seek to do with this idea of being pro-science? Dr. Rupert Sheldrake: You see, I like the science as a method approach. I think science is the best method we have for looking into things and inquiring into things in a cumulative way. It’s held back by dogmas and it took me a while to realize just what those dogmas are because when you’re learning science nobody says, “Here are the ten dogmas. You’ve got to believe these.” They’re not usually spelled out and most people aren’t even aware that they’re dogmatic assumptions. Most people within science and outside science think that these are truths, scientific truth. Many people who believe in science often say, “I believe in science,” and think that other people, religious people, have beliefs but by contrast those who believe or science or the scientific worldview know the truth. So that’s a problem. It’s making the dogmas explicit first that was the challenge. And then what I do in the book is turn them into questions. I’m not saying this dogma is wrong; I’m saying let’s take it as a question, not as a fact. For example, the dogma the mind is inside the brain. The mind is the brain becomes the question, is the mind confined to the brain? The dogma matter’s unconscious becomes is matter unconscious? The dogma the total amount and mass of energy is always the same becomes the question, is the total amount of matter and mass of energy always the same? When one turns them into questions and looks at the evidence, the facts, what science itself has shown, it turns out in every case these dogmatic assumptions are simply assumptions. They’re not just assumptions; they’re actually wrong. And yet they’re the foundations of science as it’s currently practiced. Most people aren’t even aware they’re making those assumptions. So that’s really what my book’s trying to do. When I turn them into questions there are all sorts of new sciences that become possible still using the scientific method, still using evidence, still using scientific procedures, reason, and logic and all the rest of it. But not bound to this narrow framework which is holding everything back. Alex Tsakiris: You know, I want to push that just a little bit further because early on in the book you state that “science’s intellectual prestige is almost unchallenged.” Those are your words. I wonder if there isn’t really a flip side to that. At some level that’s true and at another level it’s equally true that science has been fundamentally discredited in recent years. We can look at Climate Gate or Peak Oil or even UFOs and ghosts. Even evolution. All those are topics that have come to the fore and science has had their say. In one way or another it’s come out of it pretty battered as a result. I think the average person walking around, certainly in the U.S., will nod their head with the intellectual prestige of science nonsense but when you really speak to them privately they just don’t put a lot of stock in science. Alex Tsakiris: They are but I think people are able to understand technology and engineering and say, “Wow, this is great. My new iPhone 5 is fantastic.” And they’re able to separate that from the “scientist” who stands up there and says this or that about climate change or about any of these other topics that then turn out to be not only provably wrong but just kind of on the surface of it silly. I mean, the idea of free will or consciousness or any of these things that wind up with your propositions just looking rather silly. I think people have really internalized the extent to which science just doesn’t have these answers. Dr. Rupert Sheldrake: I think to some extent that may be true but the fact is in many of the areas where scientific dogmas prevail they’re not really challenged. They’re mostly challenged in areas like consciousness, medicine, and some of the applications of science but some of these—the conservation of mass and energy, the idea that memories are stored inside the brain, the idea that laws of nature affects quite a lot of these other dogmas are not very much discussed. I think it’s when one looks at the whole picture, the broad picture, one sees a consistent pattern. A lot of the problems that arise from science and its public image at the moment are because of its dogmatism. Also because of the way in which science is actually pursued, which is not really a culture of open debate and discussion but a kind of authoritarian system. So the book, anyway, is an attempt to look at the dogmas in a way that will help those who already have begun to question science and for those who haven’t, to show that things could be very different from the way they are now and potentially much better. Alex Tsakiris: You know, if someone reads your book, one of the propositions that you make that comes to the forefront pretty quickly is materialism, this idea that your mind is equal to your brain. You are this biological robot. You point out, I think quite convincingly, how flawed this idea really is. But I’m not sure that you answer the next question that I seem to encounter most with people that I talk to and that’s the how can this be question. Dr. Rupert Sheldrake: I think the simplest way of answering that is to look at the history of it. The history of it is that in the 17th Century the scientific revolution which gave us science as we know it was revolutionary precisely because it broke away from the earlier view which was that nature was organically like an organism, the universe was like an organism, animals and plants were truly living beings with souls. The word “animal” comes from the Latin word “animus,” the Latin word for soul. The previous view was that nature’s alive and organic. The machine theory which is what modern science was based on in the 17th Century said nature’s not alive and organic. It’s mechanical and unconscious. Animals and plants are just machines, the Earth’s a machine, the human body is a machine. The only exception in that known universe that was not a machine is the human mind, which is not material, not physical, and God and the Angels. These are part of spiritual reality. Everything else is mechanical and unconscious. That’s using dualism and that was the dualism between people and nature, humans and other animals, spirit and matter, which science was based on for two or three centuries. So they collapsed this dualism into a monism, a single thing, materialism. Matter is the only reality. And that doesn’t make much difference for engineering or making iPhones and things. But it does make a lot of difference if one’s trying to understand the nature of the human mind or consciousness. And that’s of course the biggest problem with materialism. If matter’s unconscious, how come that we’re conscious? Then they have to say that consciousness is either an illusion or it doesn’t actually do anything. It’s just a shadow around the physical activity of the brain. So consciousness becomes a huge problem and embarrassment for materialism. It’s in fact called, “the hard problem” in Philosophy of Mind. So although materialists have claimed the prestige of all of modern science and technology, they’re least successful when dealing with the nature of the human mind or consciousness. It’s not as if materialism’s been very triumphant in that area; it’s been extremely untriumphant. It’s problematic, bogged down in endless debates and problems. Of course, that is the problem that underlies many of the things discussed on Skeptiko and the Skeptiko podcasts and on the website. If the mind is nothing but the brain, then things like telepathy and other psychic phenomena ought not to exist because they imply the inference of the mind at a distance beyond the brain. So the materialist’s assumption then leads to a dogmatic denial of psychic phenomena and an attempt at all costs to deny or rubbish the evidence. So a lot of the dogmatic attitudes we encounter among skeptics, so-called skeptics, come from this belief system. It’s not just one particular belief; it’s part of a whole package of beliefs of materialist worldview, which is what my book is critiquing by taking it apart one by one and looking at the evidence. Alex Tsakiris: And I think it does a great job of that; a very convincing job of that. I do have to just play out if we do have to turn the model around though instead of science driving this materialism and this materialistic belief system if it’s not the other way around because certainly if we look at the extent to which materialism is so enmeshed in our political and economic systems in a way that would be almost impossible to pull it out. You just have to wonder if it’s a chicken and the egg thing. Can science really rescue us from that? If we come up with a different worldview that suggests all the things that lie beyond materialism, can we really get there with the kind of political and economic systems we have in place? Dr. Rupert Sheldrake: I don’t see why not. I mean, if we went beyond materialism in the realm of medicine, for example, we’d have a medical system that was more inclusive and holistic and probably cheaper. That wouldn’t please the pharmaceutical companies but it would certainly please a lot of national health services and medical insurers if one could deliver better health care cheaper by breaking down the taboos and barriers that presently mean that only mechanistic medicine is treated seriously by these funding and research agencies. I think that’s perfectly doable. There are already plenty of people doing it. It’s just not political mainstream at the moment. I don’t think that would be a huge, difficult reform. I think politically a non-materialist science, a post-materialist science that was more organic or holistic would be much more compatible with people’s own experiences. It would be much more compatible with a healthier relationship to the environment. I think that these things would probably be quite popular politically. Materialism isn’t an essential part of the apparatus of government, state, and industry. It is right now but materialism only became the predominant view within science by the late 19th Century. Before that most scientists were dualists and most governments were dualists. I’m not a dualist myself; I think it’s too limited a view. But it meant there was more harmony between science and religion and they lived in kind of separate compartments. Materialism leads to an onslaught in its more militant forms on any form of religious belief. That’s deeply upsetting politically for a lot of people. And it’s why in the U.S. there’s this kind of religious right backlash which is largely confined to the U.S. but I think one can only see the context for that in a kind of militant materialism which asserts that science disproves God, evolution shows there’s no such thing as God, and science is right, therefore, God doesn’t exist. Richard Dawkins was a professor of public understanding of science at Oxford. His Atheist views in his mind are simply equated with science. So to equate science with Atheism and materialism, then you’re going to alienate a lot of people and cause big political backlashes. I think it’s done more harm than good and actually creates more problems—far more problems than are necessary. Alex Tsakiris: I don’t know about more harm than good but I think personally it really brings the question more into focus more honestly and fairly. More on the table than to otherwise obscure it. That’s the one part I guess I’d really want to push on is at the end of the day, the end of materialism means the end of Atheism. That’s what we’re fighting about. I think it requires us to seriously consider all sorts of questions about the “spiritual.” And again, I think that’s what this debate, underlying fight, is all about. Don’t we need to be more upfront about that? And particularly in these alternative sciences like parapsychology? Don’t we have to deal with that head-on? Let me take that one small step further. To me, the implications are clear. If consciousness survives death, which seems to be most likely true, then that’s just what just about every religion throughout time has told us. And if there is some hierarchical order to consciousness, again, something that seems to be indicated by the data we have, then that sure sounds like something that we would call God–most religions would call God. Aren’t these spiritual topics really right there under the surface of that? And isn’t that what we’re really fighting about? Dr. Rupert Sheldrake: There are several eminent quite parapsychologists who are Atheist. Take Berman in Holland, for example. Richard Broughton, who used to be at the Rhine Center, now at the University of Northampton in England. Damien Broderick, who writes popular books in science fiction and knows a lot about parapsychology. He’s an Atheist and a materialist. Alex Tsakiris: But does any of that make any sense to you? Dr. Rupert Sheldrake: Well, the thing is that it does, actually. What Ed May, who did the Stargate research, he’s a materialist and Atheist and yet an eminent parapsychologist. So there isn’t a simple correlation between parapsychology and religious belief. What they hope for and what I think is a real alternative, is the narrow, dogmatic materialism we know and have could be replaced by a kind of organic, holistic worldview which wouldn’t necessarily imply the existence of God. It would be perhaps pantheistic or animistic without being theistic or deistic. So I think there’s an intermediate position which is not either just Atheistic materialism or full-blown religion and spirituality. I think there is an intermediate position where I think it could still be possible to be an Atheist but not on the basis of this narrow, dogmatic materialism but a much more sophisticated form of materialism. Alex Tsakiris: You sound much less convincing in that argument in that position. I don’t think that’s your position. Dr. Rupert Sheldrake: It’s not my position but what I don’t want, you see–I think it’s really important to be careful with arguments about Atheism and religion, which get people passionately involved with articles of personal faith and personal experience. Alex Tsakiris: I think you can decouple it from religion but from spirituality, I think that’s part of the problem. I think all these questions of the spiritual are not buried deep in these questions. They’re right there under the paper-thin surface of it. Survival of consciousness, if we just look at the data and we say, “That seems to suggest that yeah, consciousness survives death,” immediately for any man on the street as well as any scientist, immediately launches into deep questions of the spiritual. I don’t know how you get around that. Dr. Rupert Sheldrake: The survival of consciousness is one aspect of religion or spirituality but there have been spiritual people, including many Jews, for thousands of years who are religious and spiritual but don’t believe in survival of consciousness. So again, there’s not a 100% correlation between these points of view. You know, even at the time of Jesus one of the great debates going on at the time in the New Testament was being formulated in the life of Jesus and then in the subsequent discussions was the Sadducees, the temple priests, didn’t believe in survival. The Pharisees did. This was a really big debate. That debate still goes on in the Jewish community. So even though both sides are devout, religious people with a spiritual experience and dimension. I think it’s quite important to decouple these although the science is very relevant to these issues. It doesn’t map in such a way that to be an Atheist you’ve got to be a Dawkins-style materialist or to be a religious person you’ve got to be a dualist. I’m not confident memories are stored in brains. I think that brains are more like tuning devices, more like TV receivers than like video recorders. Now that’s really a scientific question, how is memory stored? We can do experiments to try and find out how memory works. It has religious implications because materialism says that memories are stored in brains. The brain decays at death, therefore, memories are wiped out at death. There’s no possibility of any kind of personal survival without memory. So for materialists it’s a simple two-step argument. Memories are stored in brains; the brain decays at death, therefore, memories are wiped out at death. Therefore all theories of survival—reincarnation, Purgatory, the Last Judgment, all theories are wiped out. Whereas, if memories are not stored in brains, if they depend on a resonance process, then the memories themselves are not wiped out at death. They’re potentially accessible. That doesn’t prove they are accessed, that there is personal survival. It just means that’s a possibility whereas with materialism it’s an impossibility. So one position leaves the question closed and the other leaves it open. Alex Tsakiris: One last question, Dr. Sheldrake. What do you think is the future for academia visa vie materialism? Again, it seems so enmeshed, so institutionalized at this point. I know you’ve mentioned that your son is studying for his Ph.D. First of all, congratulations to him on that. But let’s say he came to you and said he wanted to pursue a career in academia. What advice would you give him for trying to either get along with the system as it is, or change it in the direction that you’d like to see change happen? Dr. Rupert Sheldrake: Well, he’s doing his Ph.D. in tropical ecology in a way that’s not particularly reductionist. It’s more a holistic kind of ecological fieldwork approach. So he’s not confronting these questions in a direct, personal way. I think that there are plenty of people in academic science who are not materialists. One of the points I try to make in my book is that a great many scientists nowadays are not materialists; they’re not Atheists. The culture of science and indeed of the academic world is generally speaking Atheistic and materialistic. But that’s the kind of surface culture people pay lip service to in public. In private, there are a great many people with different views. There are a lot who are spiritual but not religious. There are a lot who are religious. There are a lot who have had mystical experiences. There are a lot who have had psychic experiences. There are a lot who have been to alternative practitioners and take seriously various alternative healing methods. In fact, add all those up and I think it will be the majority of people within science. A further point is if we look at young scientists today, the scientists of the future, last year India graduated 2-1/2 million science and engineering graduates. China, 1-1/2 million. U.S., half a million. Britain, 100,000. But in Britain and the U.S., about a third of them at graduate level were Indians, Chinese and Koreans. So the majority of young scientists in the world today are not European or American. They’re Asian. The Chinese have an ambiguous attitude. Some are very materialist; some are interested in Taoism and traditional Chinese beliefs. Most Indians, the great majority of Indian scientists are pretty straightforward Hindus and Muslims when they’re off-duty. They’re not materialists and Atheists. So most scientists today simply don’t fit into that position. But when they’re at work they don’t mention it. They pretend to go along with that overall kind of what seems like a consensus reality. As soon as they’re off-duty, they revert to completely different views. I would say the majority of scientists, in fact, lead a split life. What I’m proposing is that scientists come out, speak much more freely about their own experiences and interests to their colleagues, and they’ll find that a great many of the others share these interests or have things that they can talk about fruitfully. This materialist dogmatism is a façade behind which there are some true believers. Richard Dawkins is certainly one and he’s done us all a service by making his views explicit and expressing them so forcefully. But I think the majority don’t have those views. I think of it as being rather like Russia under Brezhnev. In that late Communist phase of the Soviet Union, in public almost everyone went along with Marxism and dialectical materialism. A few dissidents stood out against it and were sent to psychiatric institutions. The majority just went along with it as if they believed it. They dutifully clapped in public meetings to speeches by the Party leaders and so forth but when the Soviet empire collapsed, how many really believed it? Probably only quite a small minority. I think it’s rather like that in science. So I think when people feel free to come out and speak freely and when scientists feel they don’t have to pay lip service to this dogma, it’s not as if the whole academic world will suddenly oppose it as one person. They won’t. A lot of people will be enormously relieved. I think the academic world would get a new lease at life through people being able to speak and think more freely. Alex Tsakiris: That’s certainly a wonderfully optimistic future that you paint. Let’s hope we get there. Rupert, tell folks what’s coming up for you. 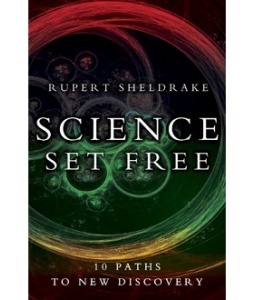 Again, the book available right now at Amazon, Science Set Free: 10 Paths to New Discovery. What’s coming up in terms of your speaking, lecture circuit? It seems like we’re always hearing about you. You’re popping up with some new YouTube videos and the like, which is great to hear. What’s coming up for you in the near future? Dr. Rupert Sheldrake: Well, in the near future in San Francisco on September the 7th at the California Institute of Integral Studies I’m giving a book launch lecture for this book, which is published in the U.S. and Canada on September 4th. On September 8th I’m giving a week-long workshop on it. The following weekend, at the Esalen Institute in Big Sur, California, I’m doing a weekend workshop on the themes of this book. Those are my main things in September. Then I’m going back to England. I’m in Canada right now. I’m going to the U.S. again in November. I’m going to be doing some talks in New York, mainly at the Open Center. I’m not doing anything in-between. My publisher said there’s no point in trying to do book promotion before a Presidential election in the U.S. So I’m not coming back until the week after the Presidential election when hopefully the hanging chads will have been sorted out and things should be getting back to normal. Meanwhile, there will be various YouTubes and discussions about the book. There’s already some lectures online about the book from my presentations in England. Anyone who’s interested can see them there on my website, www.sheldrake.org. Anyone who’s interested in knowing where I’ll be speaking, what I’ll be doing, can look at the website or sign on for my e-newsletter which I send out every couple of months. It gives an update on my various activities for those who are interested. Alex Tsakiris: Great. I get those emails and it is nice that they’re on a regular basis but you don’t overwhelm folks with useless information. It’s very well done. Well, Dr. Sheldrake, thanks again for joining us today. Best of luck with the book and hopefully we’ll touch base with you again in the not-too-distant future. Dr. Rupert Sheldrake: Good. Thanks very much. And all the best to you and the great work you do.